Dreamers Disco originally opened its doors in 2000 in the built-for-nightlife area of Puerto Banus, Spain, but the venue in Puerto Banus was sold by it’s owners in 2010, however the Dreamers brand remains alive and launches it’s new ‘Dreamers Beach Club’ venues from 2013 in Koh Samui and Ibiza, and Morocco soon after. Dreamers Beach Club Opening in Koh Samui took place on the 8th of June! Dreamers has been home to some of the greatest and most memorable dance parties in the world. In the 12 years of it’s residency in Puerto Banus, this night club became world renowned and a clear hotspot for those wanting a memorable experience in this brilliantly designed “Super Club”. With two floors and a huge max capacity of 1400 people, Dreamers became the busiest club in the area. Locals and vacationers alike lined up nightly to get inside for the hottest ticket in town…Even more so when VIP world famous DJ’s such as David Guetta, Bob Sinclair, DJ Tiesto, Erick Morillo, Swedish Mafia, Luciano, Marco Carola, Carl Cox, and many more hit the dance floor spinning music into the early hours of the morning. Of course along with the prestige came the famous celebrities, and for over a decade Dreamers Disco was known as the hotspot for some of the most the beautiful people in the world. Super models, actors, actresses and the musical elite have graced the VIP area and majestic dance floors of this nightclub. Dreamers Disco has given over 500,000 people the time of their lives in Puerto Banus for over a decade in that area, and there’s no reason to doubt that they will do the same thing at their new home! 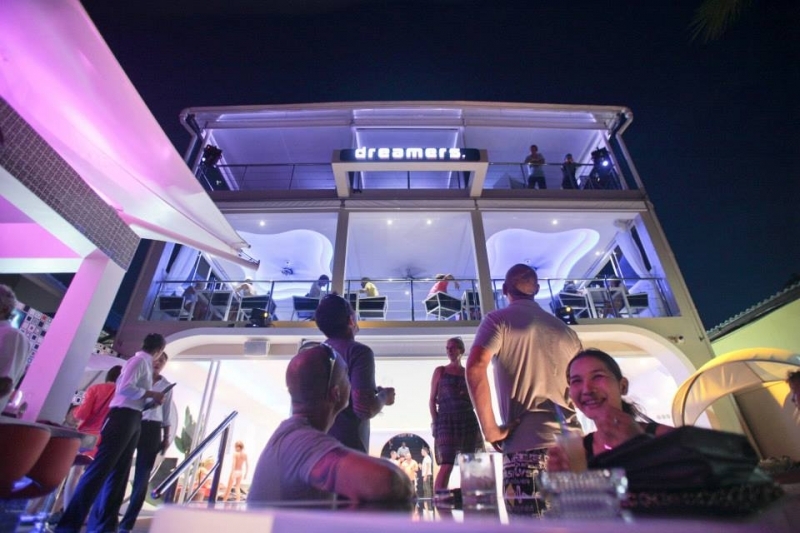 The Dreamers Disco venue in Puerto Banus was sold by it’s owners in 2010, however the Dreamers brand remains alive and launches it’s new ‘Dreamers Beach Club’ venues from 2013 in Koh Samui and Ibiza, and Morocco soon after. All the new clubs are a mirror images of one another, unifying the feel of the venues and bringing international clubbers the same VIP experience wherever they choose to visit. Dreamers – A World Class Brand.